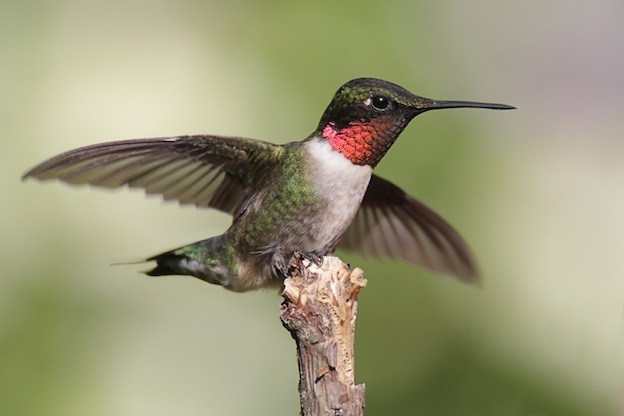 One of the most common of all species of Hummingbirds that people are familiar with is the Ruby-Throated Hummingbird. Many people recognize them because they aren’t afraid of the presence of humans. They will often remain in an area and that allows people to get a very up close look at them. This particular species of Hummingbird is about 3 ½ inches in length. The weight of a mature one is about 3 grams. They offer some very lovely colors that help them to blend into their surrounding area for protection. Therefore, those colors will vary depending on the location where the Ruby-Throated Hummingbird lives. The back side of these Hummingbirds is usually a very dark emerald green. The belly is usually gray or white. The throat area is going to be pink or red. The bill is very long and slender. They have a forked tail. The Eastern portion of North America is the main location where this species of Hummingbird is found. They are found in Canada, Mexico, and areas of the USA. When they migrate many of them often spend time in Mexico. It is complete a myth that the Ruby-Throated Hummingbird catches a ride on the backs of other birds because it is too difficult for them to migrate on their own. 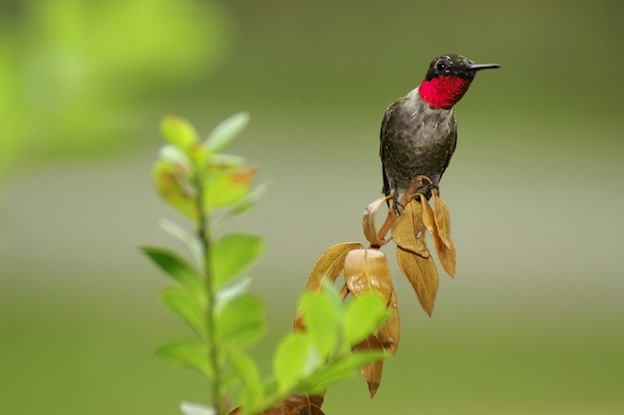 The Ruby-Throated Hummingbird is believed to be very intelligent and they are also very curious by nature. They seem to want to go explore new areas and adapt very well to changes in their environment. They do very well even in locations where humans have come into their habitat. Many of them are found around feeders that humans have put out for Hummingbirds to dine from. Males are extremely territorial though and they don’t enjoy others coming around them. They keep a larger territory for habitat and finding food that other species of Hummingbirds. They will also take on bees and wasps for territory in some areas. They are attracted to red and will go to red clothing at times thinking it is food. Nectar from plants is what the Ruby-Throated Hummingbird mainly dines upon. They are attracted to the red plants more than the others. During times of the year when food is abundant they will bypass other colors of plants and only feed from those that are red in color. They will also consume small insects that offer them plenty of protein for them to be well nourished. While the courtship process is usually very elaborate for Hummingbirds that isn’t the case for this species. The males are seldom seen doing the dives unless there are plenty of males all competing for the same female to mate with. The females are extremely picky about who they will mate with. A female may turn several males away before she selects one. The process of creating a nest for the eggs is her next order of business. It can take her several days of hard work to get a small nest created. It will be about the size of a walnut shell. The eggs will be about the size of peas. She won’t have more than 2 eggs to place in it. They will emerge about 12 days after being deposited there. They quickly develop feathers, strength, and in a few weeks they can fly off. The young Ruby-Throated Hummingbird often linger around for a couple of weeks. They will follow their mother to feeding areas. At first she is going to be tolerant of it and teach them how to find food. Yet it won’t be long before she will chase them off and away from her food resources like she would any other living things.